I’m one leg out the door on a holiday to Warsaw, Poland, and not sure when I have an access on Internet next time. In the meanwhile, there is a little guest post on my friend Harini’s blog Tongue Ticklers about a dish that I call Summer. It embodies the best of my favourite season. When I’m able to post again, it will be about a wonderful person I’ve never met face to face, but to whom I own any cooking skills I have. I read his cookbooks to the point that I finally had to tear the pages off and preserve them in plastic before a total destruction. His name is Kurma Das. For me he is prabhu, a respected teacher. He is an inspiration, not only as a cook, but as a person, too. I can’t wait to introduce him! Until then, I hope you are having as beautiful late summer as I am! See you soon. Looks delicious. Perfect for a healthy lunch. Have a lovely vacation. beautiful pics. Your blog and photography is absolutely beautiful! I can't seem to get enough. All this food looks scrumptious too. I am definitely adding you to my bookmarks. I am discovering your blog and it is gorgeous! I am fond of polenta as well! Have aownderful holiday. These looks very similar to the texture of dhokla. I'm curious about the recipe so heading oevr to Harini's to have a look! Have a wonderful holiday Lakshmi. I am yet to make polenta and may be this is the beginning of my trials:) these look fantastic and fresh! will head over to Harini's now. This looks delicious! I am excited I just discovered your gorgeous blog! Wow! Your photography is simply amazing :) Love your blog, glad to stumble it! I just discovered your blog and I am in love! what gorgeousness! I just discovered your blog through Honey & Jam. It is so beautiful! I'm really looking forward to sifting through the website further (its been bookmarked!). I love finding and trying out new vegetarian recipes. Thank you, Laura, and welcome! 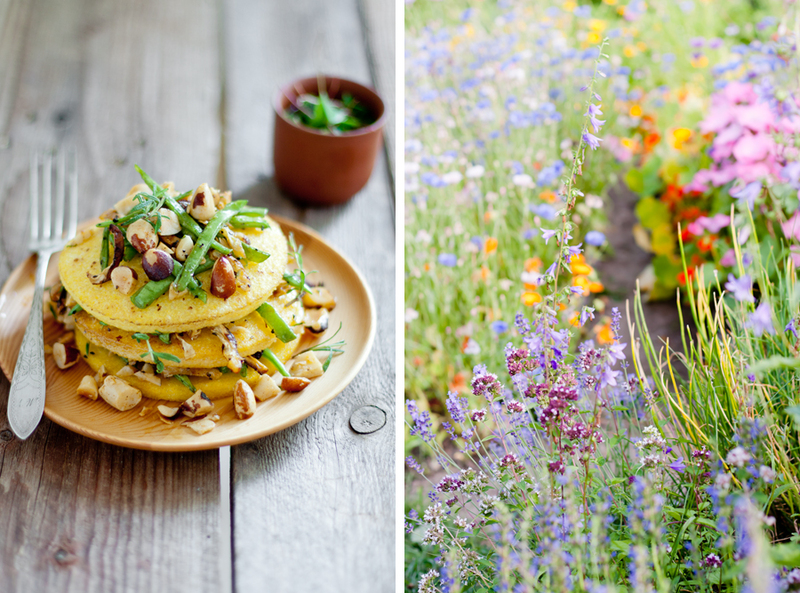 Hanna Of Honey & Jam is a super-talented cook/photographer and a sweet, sweet person I adore. You have a nice blog yourself. Everything looks healthy and balanced. I hope you don't mind me adding a link here. Of course not! I'm so flattered. Thank you! So beautiful pictures and amazing blog! I found it thanks to kurma Dasa. Hmm, nuts just make everything that much more special. Is that mushroom I see? Florida Beach Cottages - It is probably a nut. Mushrooms are excluded from my diet :-).